Established by artists in 1984, Castlefield Gallery is the first public contemporary visual art gallery to have opened in Manchester. The arrival of Castlefield Gallery in the city was a significant catalyst of what became a period of rapid cultural growth, and the increase of the presence of visual artists in the city and city region. As a registered charity, our mission drives our work to focus on artistic and career development for artists, as well as deepening audiences’ relationship to contemporary art. Over the last three decades we have become an integral part of the North of England’s cultural fabric and a vital support to artists across the North West and further afield. 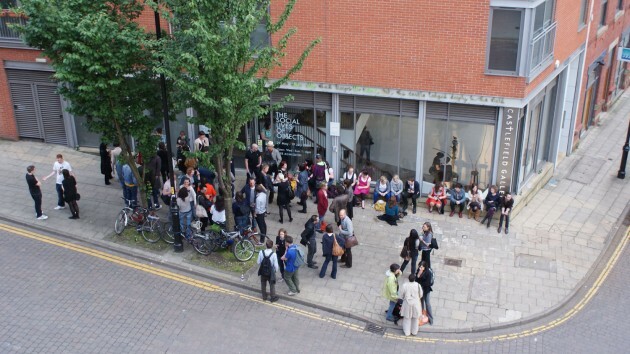 Castlefield Gallery delivers a programme of exhibitions, projects and events from our main gallery in central Manchester, whilst also commissioning, curating and producing off-site and public art, national and international artist residencies, and exchange programmes. We export art and culture developed and produced in the region through exchange so as to enable meaningful relationships between artists both nationally and internationally to flourish over extended periods of time. Partnership is at the heart of everything we do, in the last year alone our work has delivered exchanges and residencies for artists between the region, and Glasgow, London, Budapest, Geneva, South Korea (Busan and Gwangju), and Prague. Castlefield Gallery Associates is a 200+ strong artist, curator and writer membership group who access artistic, skills and career development opportunities via our work, as well as New Art Spaces – pop-up, art and production spaces located across Greater Manchester. keep costs for artists and our members affordable. Over the last three decades we have grown to become a proven leader and enabler in the development of visual artists, many Castlefield Gallery ‘alumni’ going on to experience national and international acclaim, including Turner Prize winners and nominees, exhibitors at major festivals, biennials, triennials and international presentations. Castlelfield Gallery is a registered charity, a National Portfolio Organisation of Arts Council England and Manchester City Council Cultural Partner. In May 2018, we launched Castlefield Gallery Guardians & Patrons. Until August 2019 Castlefield Gallery is a recipient of Arts Council England’s Catalyst: Evolve, an initiative that encourages the growth of private giving and organisational resilience. For this time-limited period Arts Council England will match each new donation we secure pound-for-pound. Castlefield Gallery is a limited company (Reg. No. 1838334) and registered charity (No. 515571) that owns its city centre venue thanks to Arts Council England’s capital lottery funding in 2000.